» What Does the Mars Volta Breakup Mean for At The Drive-In? What Does the Mars Volta Breakup Mean for At The Drive-In? 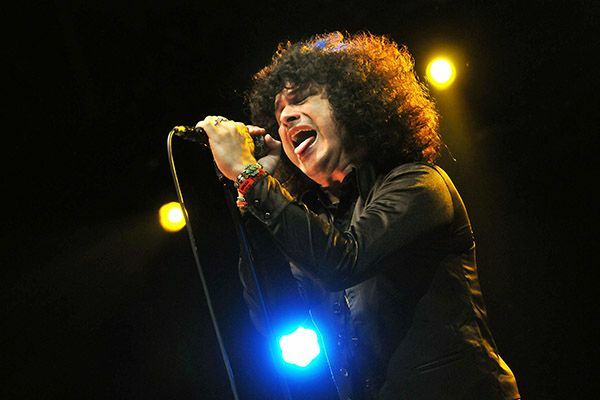 Last night, in a flurry of Twitter activity, Cedric Bixler-Zavala dissolved The Mars Volta. Bad news for people who couldn’t get enough of the band’s aggressively knotty, seemingly endless freak-out suites. (I mean, they put out six albums, and each was like a thousand minutes long and had made-up nonsense words in its title, so you’d think six would be enough. But, you know, to each his own.) Good news for people who like rock-and-roll infighting! Because, in the grand tradition of Bixler-Zavala’s old band, legendary too-beautiful-for-this-Earth spazz-rock outfit At The Drive-In, The Mars Volta just went down in wondrously acrimonious fashion. For the record I tried my hardest to get a full scale North American tour going for Noctourniquet but Omar did not want to. In a perfect bit of prescience, hours before Bixler-Zavala went off, NME published an interview with Rodriguez-Lopez about Bosnian Rainbows. Read in context, it’s excellently passive-aggressive: “It’s been very strange being without Cedric. It’s one of those bittersweet moments, it’s great for both of us because he’s making this great solo record, which is more of an acoustic thing. I’m really excited to hear another side of him and to work on music without me. He’s composing all the music, playing all the instruments, literally doing everything himself, rather than just singing over the top of my songs.” Just singing over the top of my songs. Ouch, bro. OK, now let’s get down to what’s really important here: What does Mars Volta’s breakup mean for the future of At The Drive-In? The story with ATDI, who went down in 2001, was that they split because Omar and Cedric wanted to really really get nuts and felt like the rest of the dudes were holding them back. And what was nice about that whole thing was how neatly the breakup was delineated: Omar and Cedric went on to indeed go bonkers in Mars Volta, and the rest of ATDI went on to indeed go straight and forward in Sparta. ATDI reunited in 2012, for Coachella and some other festivals, and for the sweet, sweet sound of an empty swimming pool being filled with gold doubloons that comes along with playing Coachella after your mysterious, critically adored band has been broken up for a decade. They made it clear then there were no plans to continue ATDI beyond the immediate reengagement, and so far they’ve stuck to their guns. The “tour dates” page on the band’s website is, as of my latest round of refreshing, sadly bereft. Omar and Cedric can’t get along well enough to be in Mars Volta together. Cedric thinks Omar was totally phoning it in during those ATDI shows. Omar think it’s nice Cedric is now writing his own little songs or whatever. All of that certainly doesn’t seem to bode well for more At The Drive-In! The only possibility I can see here: With Cedric having nothing but time on his hands, he calls up everyone but Omar and they play more juicy festival gigs with a guitar tech filling in. Now, I would certainly crack open the piggy bank for that kind of thing. But a sadly modulated ATDI just isn’t quite the same thing — even if Omar being checked out, and everyone knowing they were mostly doing it for the money, meant that they were sadly modulated already. Ah, it’s confusing. Bosnian Rainbows?! Here’s their debut track, “Torn Maps.” This might not be the best time to say it, but, honestly? Not bad at all.